The Story: I wanted to create a story instead of a picture. The art competition allowed me to use several (30-40) pictures photoshoped together as one image. There were many many many layers in photoshop and it took me several months to create this image, to find all the pictures in my archives so the story would come to life. Two divers find an ancient wreck, but little do they know, the creature inside will protect her treasure at any cost. She guards a chest filled with gold and she is lurking from a dark corner armed with a mighty spear. Many critters inhabit the wreck: sponges, gorgonia, lobsters, eels, angelfish, squid, glassfish, etc. Will the treasure remain in the wreck? 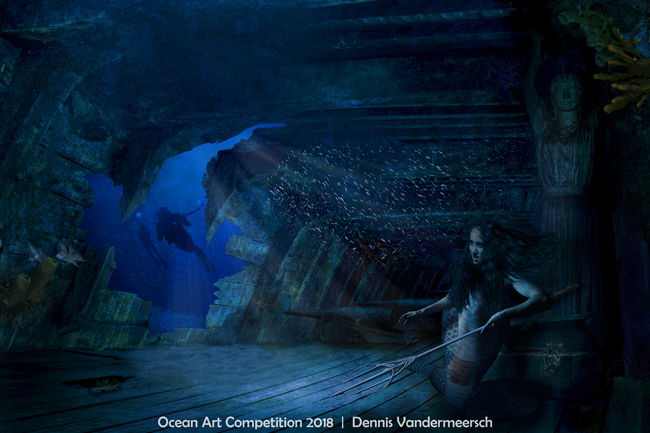 Or will the divers only escape with a photo of the creature and perhaps win the next oceanart competition with it? Equipment Used: Taken with a Nikon D810 and D300 in sealux and nauticam housing with inon strobes. Some with fisheye, some with wide-angle, even macro. I think there are about 30-40 shots woven in the end result. It's a jolly mix of different shots fused together in my mind.